My A B Seas [H1518] - $8.00 : Yarn Tree, Your wholesale source for cross stitch supplies. Cross stitch pattern by Silver Creek Samplers. Look at this adorable design to stitch for a child's room! 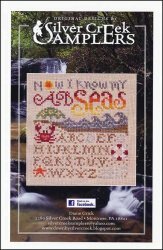 "Now I know my A B Seas," is stitched at the top of this design. Waves are splashing below with a crab hanging out under the umbrella! The alphabet is stitched below. Stitch count 62 x 67.